Please visit NerdWallet’s new credit card issuer and network statistics page for updated info. And see our credit card data page for more studies and statistics. Visa dominates transaction volumes, due to their large market share of cards issued, accounting for $3.273 trillion dollars in spending in 2010. The next largest payment network is MasterCard, which processed $2.047 trillion dollars in 2010. 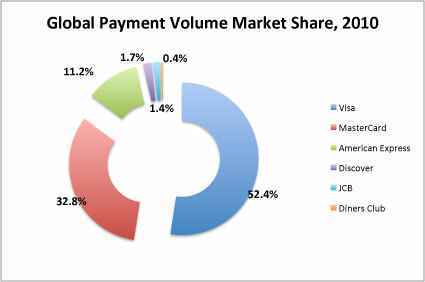 Spending on the Visa network accounted for 52.4% of global payment volume in 2010, compared to only 32.8% for MasterCard, and 11.2% at American Express. Discover placed a distant fourth place, accounting for 1.7% of spending. 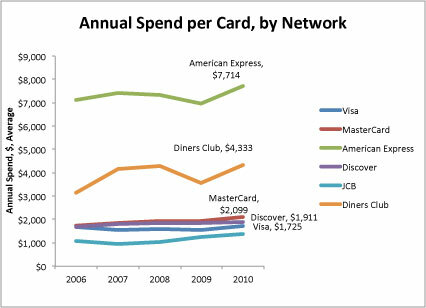 American Express users spend over $7,714 per year, per card, which far exceeds spending on any other network. As a basis of comparison, Visa users spend only $1,725 per year, per card. 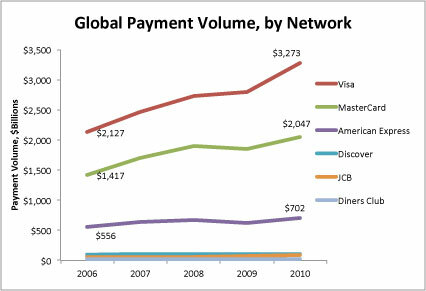 Debit payment volume is growing at a much faster clip than credit payment volume, both domestically and abroad. In terms of total spending, debit volumes exceeded credit card volumes in 2007, in the United States. Internationally, debit volumes are still a small percentage of overall spend. The fastest growing market overall is international debit cards. International debit card volumes grew at a nearly 30% compounded annual rate, from 2007 to 2011. The slowest market growth overall is occurring within US credit cards. In fact, between Visa and MasterCard, the market contracted at a 1.7% compounded annual rate, from 2007 to 2011.